Our trip to the US was via Japan Airlines (JAL), which meant we had a layover at Narita International Airport where we changed planes. The stop was over three hours and so I took my time walking from our arrival gate towards our boarding gate in the satellite terminal of the airport. This was so I could get a few, ok a lot, of photos. Of course, I wasn’t able to and didn’t take photos at sensitive areas of the airport (immigration, security checks) as these areas prohibit the use of camera and cellphones. Signs show the way for transfer passengers (Green) and those staying in Japan (Yellow). The long corridor connecting the main Terminal 2 to the satellite is quite spacious. There are moving walkways along one side of the connector’s right corridor. I will be writing a few more articles on airports in future posts. Whenever I am in a new city, I try to learn about their transport system. This includes finding out if they have some conveniences with respect to public transport like a transit card that you can use for various modes of public transport. Examples of these are cards in Singapore, Hong Kong and Japan that you can just reload (top up) and swipe or tap at terminals found in most if not all public transport. In Japan, you can even use their cards to purchase items at convenience stores or vending machines. San Diego has what it calls the Compass Card, which you can use for the trolley and bus services. 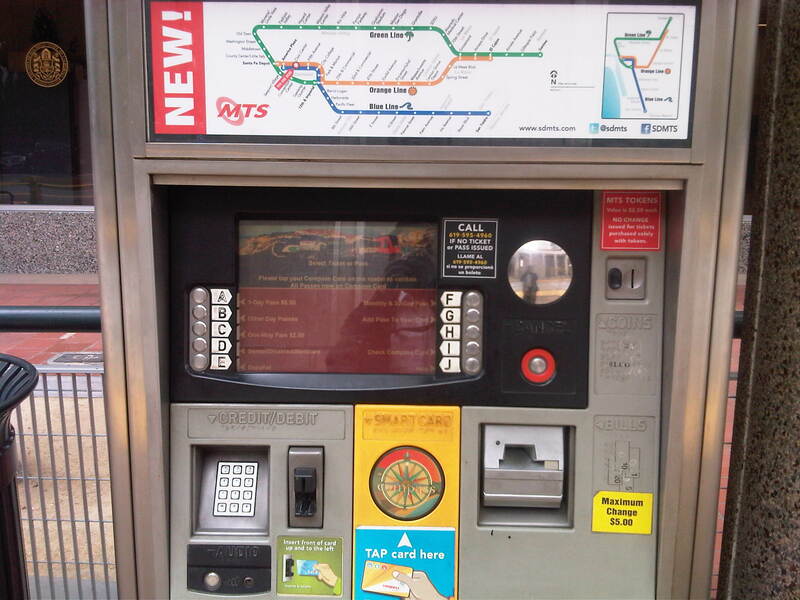 You can purchase a card from the Transit Store or at any of the machines located at the trolley stations. The Compass Card can be used to load day passes (instead of purchasing paper passes). Compass card vending and reloading machine – you can also purchase special tickets here like the 1-day Pass that basically allows you to have unlimited use of the trolley and buses within the day of purchase. At the back of the card are information on the use, care and expiration of the card. 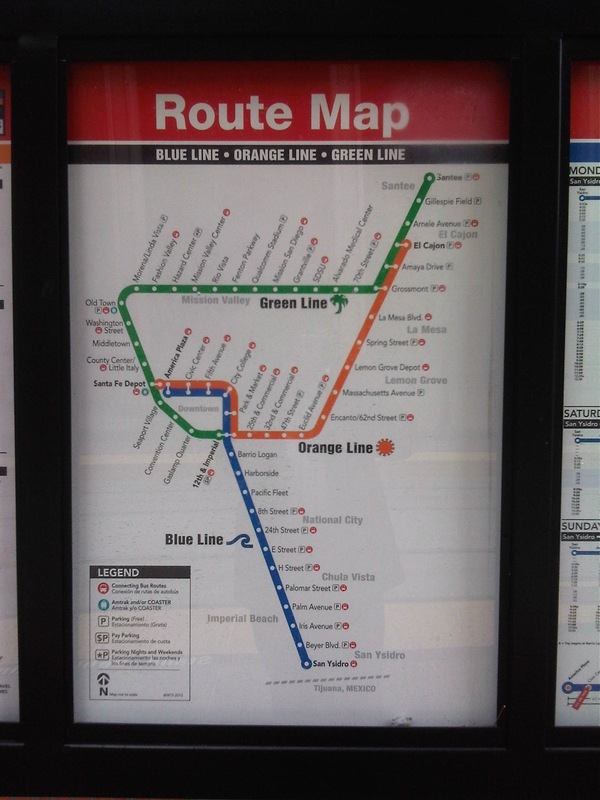 A close-up of the route map for the San Diego trolley’s three lines. More detailed information on the Compass Card can be found in this link. I will write about the trolleys in succeeding posts. I came back from a trip to find the road in front of our home suddenly become a busy road. The road is the only alternate route to the main road in our subdivision and with the rehabilitation work on the main road, residents from the inner parts of the village have no choice but to go through a longer route when leaving and returning home. Start of roadworks – my first observation was that there was no proper curing applied to the new concrete pavement. Completed lane without curing – proper curing means the slab should have been watered as concrete releases heat as it hardens. With the hot weather we experience during the dry season, curing is all the more important for the concrete to achieve the desired strength over the typical period of 14 to 21 days. End of the project – the project is with the City of Antipolo and part of our subdivision is in the Municipality of Taytay. The concreting ends at the boundary of Antipolo and Taytay. With the increased number of trucks entering the subdivision due to the many residential construction projects currently on full swing, I hope that the concrete slabs will not be damaged and require major repair. The fact that the contractor did not cure the concrete properly brings questions whether the concrete was able to achieve full strength over the prescribed period. This is actually a reflection of current construction practices in the country that were subject of several researches we’ve made and presented in several venues. The issue remain generally disregarded by the DPWH and likely by most local government units for projects under them. Sumulong Highway is the main road connecting Antipolo City with Marikina City and ultimately to Cainta, Pasig and Quezon City via Marcos Highway. It is basically a 4-lane, 2-way undivided road with several sections that have 3 lanes total probably due to ROW acquisition issues when the highway was widened from the original 2-lane road. I came back from a trip recently to find road works along my commute and took some photos of what would definitely be an improvement to the highway. The uneven number of lanes along several sections of Sumulong has led to road crashes and surely many near misses among motorists and cyclists using the highway. There is also a need to provide space for pedestrians and others on foot considering the highway is one of the major routes to the Shrine of Our Lady of Peace and Good Voyage – a major pilgrimage site for Filipinos. Construction along the inbound direction of Sumulong Highway include drainage works aside from the construction of an additional lane to make the number of lanes even (2 per direction). At present, there are 2 lanes along the outbound direction and a single lane (shown clearly in the photo) along the inbound lane. The section shown is near the Garden of Gethsemane and Palos Verdes subdivision. 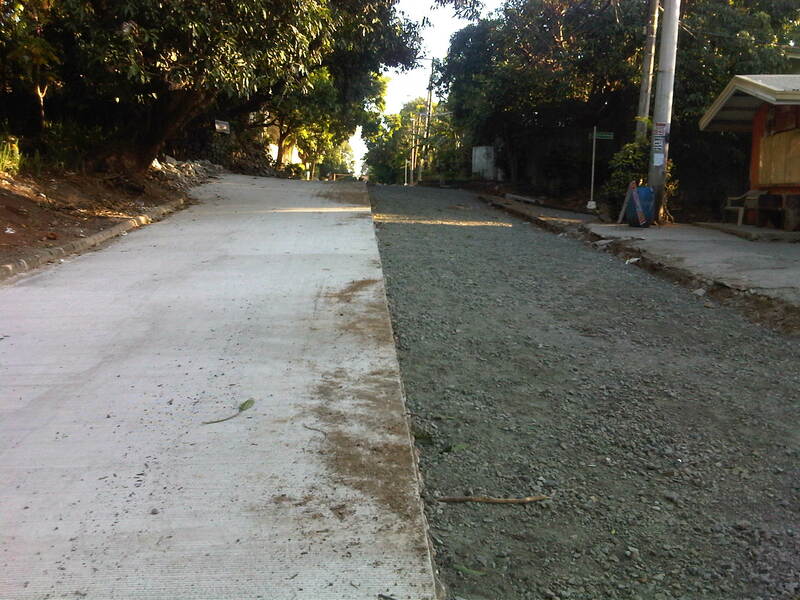 Completed lane, drainage and sidewalk along the outbound direction of Sumulong Highway right after Metro View subdivision. Widening along the outbound direction between Metro View and Valley Golf includes drainage works. 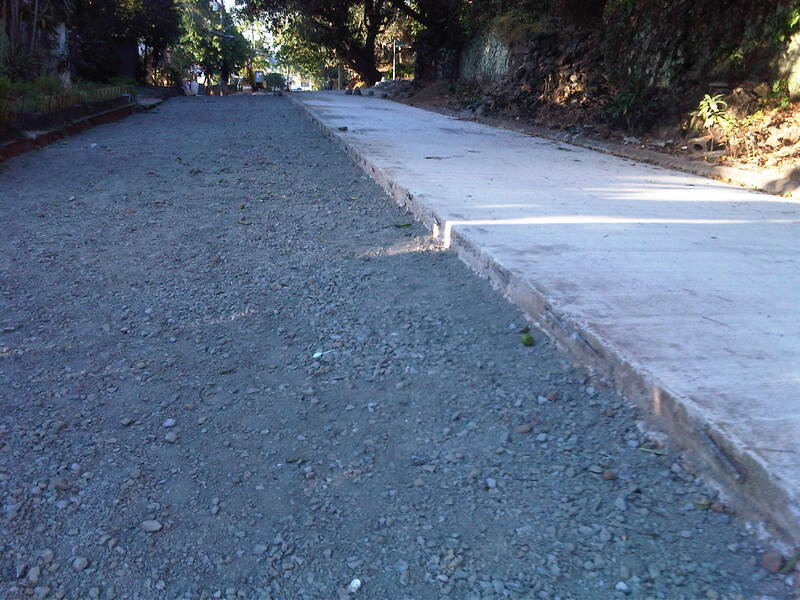 There will be a sidewalk on top of the drainage that should enhance safety for walking/trekking. There are many informal settlers as well as formal ones encroaching on the RROW. Part of the project is to remove these and other obstructions. I just hope that the sidewalks and the curbside lane will remain clear of obstructions. The completion of the road widening project is expected to improve the flow of traffic along Sumulong Highway as there will be a continuous 2 lanes available along either direction for safe and effective passing. The additional lane also means public transport may stop along the roadside without blocking through traffic. Trucks and slow moving vehicles (tricycles?) may also be required to take a designated lane. Moreover, since there is a significant volume of bicycle users along Sumulong Highway, there will be enough safe space for them to travel. The current volume of motorised vehicle traffic along the highway requires only 1 lane per direction (2 lanes total) and these are the innermost lanes of the road. Traffic slows down usually because of trucks or tricycle operations/maneuvers. In theory, the 2 outer lanes can be used only for overtaking, stopping and cycling. These should be clear of parked vehicles particularly along areas where there are communities and businesses (e.g., vulcanising, auto repair shops, etc.) along the roadside. An article came out recently about the four new transport categories introduced by the Department of Transportation and Communications (DOTC). “Vehicles of application-based, ride-sharing service providers, like Uber, GrabTaxi, Tripda, and EasyTaxi, will now fall under the category TNVS. TNVS will cover vehicles that provide pre-arranged transportation services for compensation, using an online-enabled application or platform technology to connect passengers with drivers using their personal vehicles, Abaya said. These new rules will also allow ride-sharing service providers to accept regular passengers heading to any point of destination in the country, Abaya added. Operators of TNVS, called Transportation Network Companies, are also required to screen and accredit drivers and register them with the Land Transportation Franchising and Regulatory Board (LTFRB). All TNVS vehicles will also be required to install and use global positioning system (GPS) tracking and navigation devices. Only sedans, Asian Utility Vehicles, Sports Utility Vehicles, vans, or similar vehicles will be allowed, and these should not be older than 7 years. “…vehicles with a 7-year age limit under this new category will be equipped with GPS, online and smartphone booking capability, and cashless transactions through credit or debit card payments. I won’t mention the BRT anymore. It deserves its own feature (as if the previous ones on it are not enough to describe the system), and is the only mass transit among the 4 categories “introduced” by the DOTC. These new transport categories are obviously a step in the right direction. These are not new ideas and the institution of these categories by the DOTC is long overdue considering that the agency had to go through this process in order to address legal issues pertaining to such services. In the case of TNVS and Uber, for example, much has been mentioned about franchise issues and how Uber was illegal under the prevailing set-up. It is good to have another option to the regular taxis but then weren’t GrabTaxi and EasyTaxi were supposed to have enhanced services? As for airport buses, such limousine services have been in operation in many other countries. Unfortunately, in Metro Manila’s case, these buses would have to contend with worsening traffic conditions along most major roads connecting the airport terminals to the various points of interest mentioned in the article (e.g., Makati CBD, BGC, Ortigas CBD, etc.). It is good though that Green Frog was mentioned in the article as the new category provides an opportunity for cleaner and more efficient technologies to be applied to transport services. Still, if these services will be operated by reckless drivers then they won’t be much better than what we already have at present. This is a continuation of the previous article providing updates on NAIA Terminal 1. The terminal is currently being renovated and what used to be the most maligned terminal in the country has improved both in terms of facilities (including the toilets!) and processes (immigration was efficient when I passed through). Here are more photos of the terminal from my recent trip. The same Duty Free shops were there. The lighting was basically the same but area seems cleaner than before. There are few Duty Free shops are T1 compared to other international terminals, which are like shopping malls in terms of selections (e.g., Changi, Hong Kong, etc.). Many areas have been cordoned off for the renovation works at the terminal. A welcome sight for many, especially those wanting to have a decent cup of coffee or tea would be the Starbucks at T1. One of the new concessionaires at Terminal 1 is a welcome sight to passengers who before had to make do with food and drink stands that weren’t as attractive. Another new concessionaire is this coffee shop at T1 offering what looked like fairly prices (for an airport) drinks, sandwiches and meals. The corridor to our boarding gate has been repaired and cleaned. The carpets no longer looked filthy and were not smelly. There were plenty of available seats as passengers only started to arrive at the pre departure area. The seats were basically the same ones here when I last used T1. Though not needing to be reupholstered, these require proper and regular cleaning considering all the people who have gone through the airport. I will post again soon on Terminal 1 but from the arrival perspective. The long-delayed renovations to the Manila’s Ninoy Aquino International Airport (NAIA) Terminal 1 was finally undertaken a few months ago. The much maligned airport terminal has been dubbed as the worst terminal in the world, with poorly maintained facilities including dirty toilets. It is certainly not the worst airport in the country but fails as a international gateway. Here are a few photo I took recently upon checking in for a flight. The main departure lobby seems so spacious with significantly fewer passengers now using the terminal. Many major airlines have transferred to Terminal 3 including Singapore Airlines, Cathay Pacific, Delta and Emirates. They must have changed the lighting as the area is not as gloomy as before. Proper illumination plus what looks like recently sanded and polished marble equals a more refined departure lobby. Even the check-in counters have been renovated. Other counters are vacant due to the transfer (temporary?) of other airlines to Terminal 3. Japan Airlines counters opened just in time and the queues were orderly. Business class counters accommodated economy passengers whenever they were available (not processing business class passengers). More on the renovations in the next post!